As a Tampa Bay focused wedding blogger, I never dreamed of attending New York City Bridal Fashion Week, also known as Bridal Market, but I was lucky enough to spend an action packed six days there this past fall. I made the journey to NYC with approximately 15 other top wedding bloggers, all members of the Aisle Society. With the help of my fellow seasoned wedding pros, I had a jammed packed schedule with dessert parties, runway shows, private appointments with bridal designers, plus amazing soirees (including the Martha Stewart Weddings party) filled with the latest looks in bridal fashion. As memorable as this experience was, planning my NYC Bridal Fashion Week schedule was honestly like planning a wedding. You need to have a game plan and very specific timeline or your going to royally screw up your whole day. 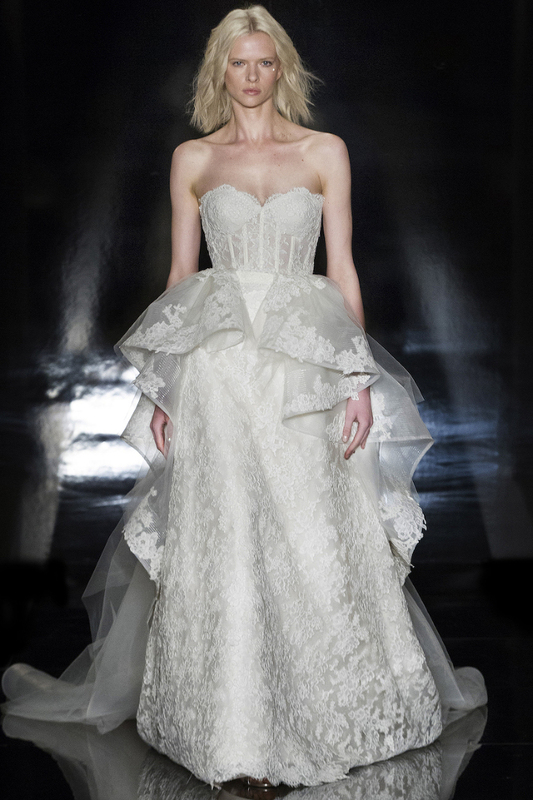 Here are the 6 things to know when planning your first NYC Bridal Fashion Week. I’ve traveled to NYC several times and never had a problem finding a hotel under $200. Of course it wasn’t a super fancy hotel, but it was clean and comfortable enough. I had no idea that October is one of the most expensive months to travel to the Big Apple. I’m not sure if Bridal Market has anything to do with it or maybe it has something to do with the thousands of people who also attend Comic Con, which happened to be the same week. However, book months in advance or you’re going to pay at least $350 a night. My roomies and I contacted over 75 Airbnb listings and only one was available, so that’s where we crashed for our week-long stay. (Click on the link to save $20 on your first rental). Most everything happens in these parts of the city. The Knot Couture exhibit was at the Metropolitan Pavilion in Chelsea and the Piers 92/94 exhibits are located in Midtown, while most other private showings are also in the vicinity. I know some people may hate it, but I don’t mind taking the metro; it makes me feel like a real New Yorker, and it’s fast and cheap. On our first day, I paid $31 for an unlimited 7-day NYC Metro pass, which I used a four to five times a day. However, if your appointments are back-to-back, as most are, you’ll need to ride via Uber or taxi when you’re on a time crunch. Also there are no metro stops near the Piers, so each time you travel there you’ll need to pay cab fare. If you’re traveling with others, be strategic about carpooling. You’ll find lots of people leaving one show and going to the next one, though everyone is in a panic and just darts off. Don’t forget to have your Uber referral link handy to pass along to new Uberers, and you’ll get a $20 credit. While more established bloggers receive invites from the designers or their PR companies, if this is your first show, you’ll need to reach out to them. Unless you’re trying to go to super exclusive designers, most will provide you with an invite. You can also purchase a subscription to Fashion Calendar for $150, which tells you the dates, times and contacts for most of the Bridal Market shows. Appointments can be in the form of a runway show, private showings or open houses. As the afternoon goes on, runway shows often start late, which throws off your day (along with EVERYONE else). With this delay and getting around the city, you’re bound to miss an appointment. Sometimes, if you don’t have an appointment you can still show up and, if there is extra room, they will accommodate you. Though, this may not be the case for a private showing. Since I’m a local wedding blogger, I reached out to bridal shops in my area, with whom I work with and attended with them at their appointments. It give me great perspective to see how they interact and how things work from a buyer’s side. Flats. Wear comfortable shoes for God’s sake! You will literally walk the equivalent of a 5k every day, so you must be comfortable. Many attendees will bring a large tote and have their heels in that. I am not a much a high heel girl, so I just had some cute sparkly flats that got me through the week. Though, I wish I would have bought some type of cushion insert. Most people wear cute dresses (think little black dress) or dress slacks with a cute top, but remember, you’re not going to a club or bar, so make it tasteful. Whatever you’d wear to a wedding business networking event (no suits though) will work. Depending on the parties you’re invited too, you’ll need to bring some cocktail dresses and maybe even a more formal dress (especially for the Martha party). Snacks. You will not eat. You will not have time to eat. You WILL get “hangry” (hungry/angry). You will live off of champagne and cupcakes. If you find yourself with 15 minutes to spare, use that time to eat. Who knows when you’ll get to again. Portable phone charger. You will take lots of pictures. Your phone will constantly be on for GPS and social media. Your phone will die right around lunch time, so you need to have an additional power source. You’ll also want to make sure you have lots of storage on your phone, so clean off those vacation pics from 2015. Cash. You’ll be splitting cabs, grabbing snacks from food stands, etc. Cash is still very much a thing in NYC. We’d love to hear about your Bridal Market experiences! Share below!